Hyperthyroidism occurs when the thyroid gland (located in the neck) over produces the thyroid hormones THYROXINE (T4) and TRI-IODOTHYRONINE (T3). Are essential for proper growth of body cells and the development of these cells for specific rolls in the body. Help regulate the metabolism of protein, fat and carbohydrate by cells. Are involved in the regulation of heat production and oxygen consumption, and therefore a wide range of metabolic processes. As a result, an excess of thyroid hormones affects the functions of virtually every organ system. The thyroid gland is divided into two lobes which lie on either side of the trachea (wind-pipe). Hyperthyroidism may be UNILATERAL (causing one lobe to be enlarged), or more commonly BILATERAL (70% of cases), causing both lobes to be enlarged. 98% of hyperthyroid cases are BENIGN (i.e. non-cancerous), with the remaining 2% of cases caused by a malignant cancerous growth of the thyroid gland – THYROID CARCINOMA. Although the thyroid gland usually enlarges with hyperthyroidism, this is not usually visible. Careful palpation of the glands by your vet may allow detection of an enlarged thyroid gland – “GOITRE” – but in some cases the overactive thyroid tissue may be located at an unusual site such as within the chest cavity – ECTOPIC THYROID TISSUE – and so cannot be palpated. Diagnosis is usually with a simple blood test that measures the concentration of the T4 hormone, but occasionally additional tests are needed to confirm a diagnosis. Since most cats with hyperthyroidism are older, it is sensible to also run blood tests to check your cat’s general organ function, as other illnesses -especially kidney disease – often occur alongside hyperthyroidism. Other tests may also be advised based on your cat’s clinical symptoms, such as BLOOD PRESSURE CHECK and ECG or HEART IMAGING (such as x-rays or ultrasound), as some cats develop secondary heart disease due to the cat’s increased heart rate and workload. SCINTIGRAPHY is available in some specialist centres and can be useful in some cases of hyperthyroidism. The technique involves injecting a very small dose of a radioactive chemical (Technetium) into the cat’s vein which is then selectively taken up by abnormal thyroid tissue, and this can be detected using a special camera (a ‘GAMMA CAMERA‘). This is a simple, safe and easy procedure. Scintigraphy will not only confirm a hyperthyroid diagnosis, but importantly, it will locate exactly where the abnormal thyroid tissue is to determine if a surgical approach is viable, particularly if there is no clear identifiable enlarged thyroid gland on examination. There are several different treatment options readily available for cats with hyperthyroidism. MEDICATION with ANTI-THYROID DRUGS is by far the most popular treatment method. TABLETS have been the main-stay of treatment for many years, but many owners struggle to give tablets to their cats on a regular basis, and especially so with more irritable hyperthyroid cats! We now have an ORAL SYRUP available as our first-line treatment for hyperthyroidism, which is highly palatable and well tolerated by most cats. A final option for medical management of cats that will not tolerate oral medication, is a TRANSDERMAL GEL that is applied to the skin on the ear and absorbed. It is important to be aware that medical therapy of hyperthyroidism is not a cure, but should help to control the condition and reduce clinical symptoms. Therefore cats treated with medication will generally require life-long treatment. RADIO-IODINE is a very safe and highly effective treatment for hyperthyroidism, with most cases (around 95%) being CURATIVE without the need for ongoing treatment. A single injection of RADIOACTIVE IODINE is simply administered under the skin, and the iodine is actively taken up by the thyroid tissue, resulting in a local accumulaton of radioactive material within the abnormal thyroid tissue, thus destroying it. Cats are classed as being “radio-active” for a period of time following treatment and so need to be hospitalised at the specialist centre for a while as a precaution. Radio-iodine therapy is considered the “GOLD STANDARD” treatment option for hyperthyroidism, and although the cost of treatment may seem very expensive, it is often similar to the cost of lifelong medical management. A relatively new treatment option is a PRESCRIPTION DIET which contains strictly controlled levels of IODINE – iodine is used by the thyroid gland to make thyroid hormones, so if there is only sufficient iodine in the diet to make normal levels of these hormones then this can help with control of the disease. 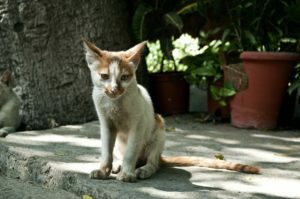 This treatment method can be very successful for some cats, but as with medical management, it is not curative and so is generally required as a life-long control option. It is also vital that the prescription diet is fed exclusively for it to be effective, and so is unsuitable for cats that go outdoors and may hunt, and may be difficult to maintain in a multi-cat household. A THYROIDECTOMY involves surgical removal of the affected thyroid lobe(s), and can be a permanent cure for many cats. However, in some cases, signs of hyperthyroidism will develop again later in life if previously unaffected thyroid tissue becomes diseased. As hyperthyroidism causes an increased metabolism with possible secondary complications such as HIGH BLOOD PRESSURE (HYPERTENSION) and HEART DISEASE, it is therefore prudent to stabilise patients using anti-thyroid medication, prior to surgery to minimise the associated anaesthetic risk. The major risk associated with the surgery itself is inadvertent damage to the PARATHYROID GLANDS, which lie close to or within the thyroid glands themselves, and play a crucial role in maintaining stable blood calcium levels. As surgical thyroidectomy holds a small risk of temporary interference with calcium regulation, some cats may need to be hospitalised for a few days following surgery to monitor blood calcium levels. HORNER’S SYNDROME may occur in some cats and is recognised as a droopy upper eyelid, smaller pupil, and sunken eye with protrusion of the 3rd eyelid. This is a very rare potential complication of thyroidectomy due to the close proximity of specific nerves in the area of the thyroid gland, and is usually temporary although it may take weeks or months to resolve. CHRONIC KIDNEY DISEASE (CKD) commonly occurs in older cats so is often seen as a concurrent disease to hyperthyroidism. Hyperthyroidism can “mask” kidney disease as the elevated metabolic rate helps support the blood flow through the kidneys – the GLOMERULAR FILTRATION RATE (GFR). Once hyperthyroidism becomes controlled, then kidney disease may be revealed on blood profiles as their function deteriorates. It is therefore advisable that all hyperthyroid cats are given initial reversible medical or dietary management for several weeks before committing to a permanent treatment such as radio-iodine or surgical thyroidectomy, to allow any concurrent kidney disease to become apparent, as keeping the cat in a semi-hyperthyroid state will then be more appropriate to help support kidney function. Hyperthyroidism is a very commonly encountered condition in our feline patients, and can have further complications associated with the disease. It is therefore sensible to be pro-active in diagnosing patients with hyperthyroidism, and as such our vets may recommend routine screening with blood tests at health-check and booster vaccination appointments as your cat gets older, as controlling the disease before clinical symptoms appear will provide a much more favourable outcome.